LOOKING FOR UPHOLSTERED WALL SERVICES! Today, homeowners are searching for upholstered wall services with a simple and clean finish. If you are thinking of having a room or several rooms with fabric on walls, this is the place to investigate. VE THOMAN may have the answer. The company installs elegant wall upholstery using an excellent fabric wall system. Have you heard of clean edge wall upholstery? It is wall upholstery installed without any fancy decorative braid and nails around the perimeter of the room. This type of installation is well adapted to fit in any style of homes, especially in modern interiors. Clean edge wall upholstery goes everywhere, in a basic room to very busy spaces. With this unique method, V.E. THOMAN transforms walls and ceilings in high-end homes from coast to coast. 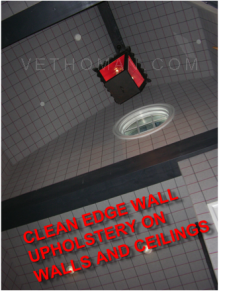 The owner of the company has a vast experience installing clean edge wall upholstery. He has spent years improving the fitting technique. Wall upholstery is his passion. Eric installs wall upholstery in the most challenging spaces. To prove it, he invites you to see at the media available on his website. In fact, many projects in the portfolio present rooms with interesting challenges. Take the time to look at the videos too. Some spaces require additional sound absorbing material from half an inch to several inches. For example, they do install these sound barrier boards in home theaters. Several options are possible for acoustical home walls. VE THOMAN provides quality installation and offers impeccable upholstered wall services. An increasing number of clients recognize Eric’s talent. A few professionals have kindly left a few reviews on Houzz. If you an interior designer, a builder, an acoustic consultant, you are welcome to contact us with your project. Did you know that Wall upholstery started as portable hangings? During the medieval period to keep Kings and Queen’s stone castle warmer and more comfortable, tapestries hung across the doorways. Also, bedrooms had hangings made from woven wool or linen. These thick materials fitted around the posts of a bed kept the cold away in France, England or Italy. Because of their travels, nobility contributed to the spreading of tapestries for the walls. At the same time, various types of hangings or fabrics reached other countries. In the 17 century, people stopped gradually to be on the move, settling in their homes. Consequently portable hangings became permanent. The European practice of applying fabric on walls dates from that period. The homes of the wealthy in this century had great interiors with furniture, fabric wall coverings, draperies well coordinated. Emperors, tsar had magnificent fabrics in their large rooms. Still, we can admire some in few palaces and castles across Europe. In France, you have the famous Chateau de Versailles and Chateau de Fontainebleau. Further east in Vienna, Austria, the Schönbrunn Palace. Traditionally used to decorate the homes of the aristocracy, wall upholstery remains an art form that requires skilled craftsmanship. When plastic arrived on the market, new products were born. As a result, upholstery evolved for other fitting techniques. Today, wall upholstery tacks are replaced slowly by track systems. Note that most tracks are very good for commercial installation, but they will not work well in residential interiors. Our homes have not the same finish compare to the public environment. For example, moldings around the rooms have far more features like below a window. Even at the top and bottom of custom made cabinets or on a mantelpiece over a chimney, a home has complex millwork. The architectural details are definitively more present in private residences. Therefore, some of these tracks won’t do the job. I encourage you to take the time to compare all of the products out there. Finally, keep in mind wall upholstery is a specialty trade. It is performed by a qualified upholsterer. Choose your contractor carefully. To give you an idea of wall upholstery installation, start by looking at the pictures or videos on this website. You will see good pictures, even the details. We have nothing to hide. And when you are ready, why don’t you try VE THOMAN’s upholstered wall services, call or email! Stay in touch on Facebook here.